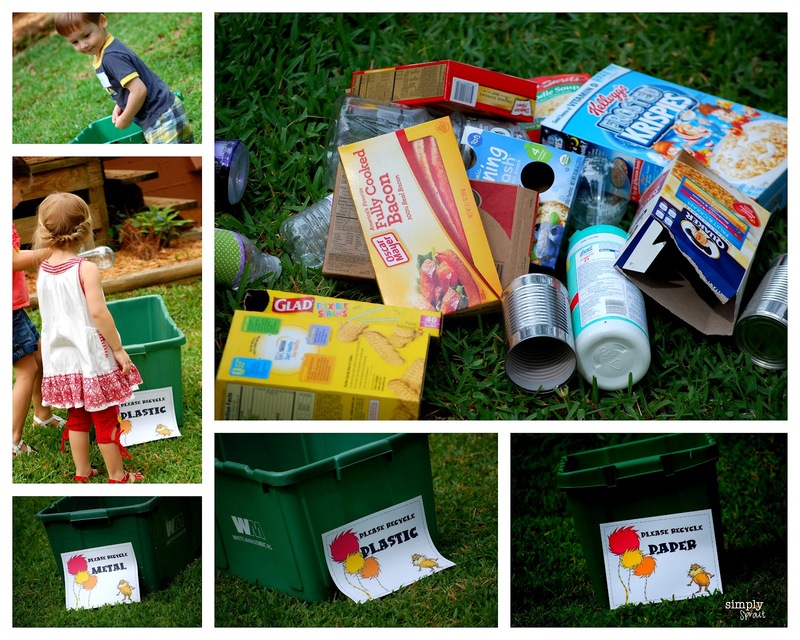 Simply Sprout hosted a Lorax party for Earth Day where our preschool friends learned about conservation, recycling and keeping the earth clean. 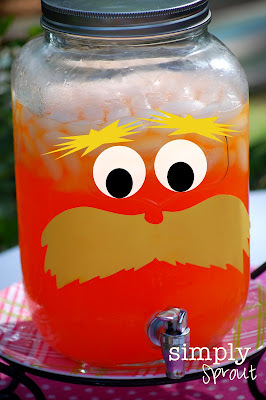 They learned a few lessons from our friend the Lorax and had a lot of fun along the way. The little ones learned all about different recyclable materials and how to sort like objects. They sorted the paper, plastic and metal and put them into the corresponding bins...they caught on so quick! I see a lot of future recyclers in our midst.This is definitely a job they can help with around the house. Our little friends painted personalized canvases using recycled materials. They each got their very own canvas, and chose their paint colors. They used plastic bags to apply the paint onto the canvas and then paper towel rolls to apply circles onto their painting. When they were all finished we removed the painters tape to reveal their masterpieces. They turned out simply beautiful....we definitely have some budding artist in our group! The last of the "Truffula Seeds"
The kids decorated their own pots and planted the very last of the "truffula seeds!" They practiced identifying their colors and made their own swirl paper using liquid starch and craft paint. They loved seeing how their designs floated right on top of the starch. Even our littlest of sprouts got in on the action. To make the swirl pots just pour some liquid starch into a shallow container, add a few drops of craft paint. Have little ones create a swirl design using a toothpick. Then take your paper insert from the pot and float on top of the starch, pick up gently and set aside to dry. While our little ones waited for theirs to dry they listened to our inspiration story, The Lorax by Dr. Seuss. For treats they made "Truffula tree" cupcakes with coconut and cotton candy among other things. The lil sprouts iced their very own orange cupcake and added a little bit of coconut flakes ( dyed green of course) They put their cotton candy tufts onto the end of the straw and added it to their cupcake. They washed their cupcake down with a little bit of Lorax Lemonade! On the way out our little friends took a treat with them to remind them of all the fun they had today learning and exploring! Our Little Loraxes learned a whole awful lot! It was lots of fun and educational too! A perfect way to celebrate Earth Day! Thanks Randi! They were a whole lot of fun to make, you should bring the boys for the next one.